Right: El Santuario de Chimayó church. Left: Weaving at Centinela Traditional Arts in Chimayó. “WE GET LOTS OF LOOKERS, and some very serious buyers, too—it’s a great mix,” Bill Franke, owner of Hand Artes Gallery in Truchas, says of the High Road Art Tour, which occupies consecutive weekends in late September (September 17–18 and 24–25 this year). Like most of the roughly 20 art studio tours throughout the state, many of them in autumn, this spirited event lends itself to setting off on a spectacularly scenic road trip. You’ll encounter mountain views from your car window and lively artwork within the walls of the more than 40 participating studios and galleries. Spend the morning at a couple of famous sources of traditional weaving: Ortega’s Weaving Shop, where weavers have produced gorgeous blankets, place mats, belts, and clothing for eight generations, and Centinela Traditional Arts, which stocks an award-winning array of hand-dyed and -woven tapestries in both traditional and contemporary designs; the lauded Irvin Trujillo weaves his artwork here. Another notable stop is El Potrero Trading Post, next to the Santuario de Chimayó inside the old (and often photographed) Vigil Store. You’ll find Day of the Dead figures, turquoise rosaries, silver milagros, and beautiful woodwork, including the unadorned yet intricately carved santos and bultos of Sabinita Lopez Ortiz, whose home studio in nearby Cordova is also open on tour weekends. For a quick bite, slip into nearby Leona’s Restaurante, which turns out tasty made-from-scratch short-order fare, such as zucchini, pork, or chicken tamales and hearty Frito pies. For a more leisurely repast in a stunning setting, dine at historic Rancho de Chimayó—specialties include blue-corn shrimp enchiladas and tortilla soup—soaking up the charming Spanish Colonial décor and rear courtyard. Above: Friendly dogs welcome you to Truchas. In Truchas you’ll discover some of the largest multi-artist galleries on the tour. High Road MarketPlace has been a co-op gallery since 2000 and contains a tremendous variety of works, including higher-end, large pieces and smaller, attractively priced items—tiny birdhouses, curvy hand-lathed-aspen salad bowls, wrought-iron fireplace tools, and small trays with fat happy cats painted on them. During this year’s tour, a small farmers’ market beside the gallery will sell local produce—heritage tomatoes, pears, and peaches. A few Truchas farms also welcome visitors, including Tooley’s Trees, known for its sustainably raised apple, cherry, spruce, and other mostly drought-tolerant species, and Zia Queenbee Co., which raises bees and sells delicious raw honey. Take a short drive through the village center to Hand Artes Gallery, a large, light-filled adobe house that shows carved santos, mixed-media installations, and abstract oil paintings by more than a dozen local talents, among them sculptor William Maxon, painter and woodcarver Sheila Mahoney Keefe, glass artist George Zarolinski, and legendary Costa Rica–born painter, poet, and composer Alvaro Cardona-Hine (who has his own gallery nearby). Hand Artes sometimes brings in a noted local artist on tour weekends. Last year, a renowned furniture maker worked and mingled with guests in the sculpture garden. Get an early start from Taos and return along the High Road to Peñasco, turning off the main route onto NM 73 (follow the signs toward Santa Barbara campground) for a couple of interesting studios in the farming community of Llano. Pay attention to the scenery: You may recognize it from the paintings of many High Road artists. You’ll know you’ve found the home studio of Leigh Gusterson when you see the dilapidated late-forties pickup truck in the front yard—it sort of looks like an art installation, and indeed, old trucks often appear in her boldly colored plein air landscapes. Continuing along bumpy, unpaved Upper Llano Road, you’ll eventually reach the corrugated-tin-roof studio of Joe Ortega, who specializes in traditional hand-carved retablos and crucifijos. His place is nestled in the piney Sangre de Cristo foothills. Back in Peñasco, brunch awaits at the fabulous Sugar Nymphs Bistro, where the weekend specialties rotate but might include house-made tequila-cured gravlax or waffles topped with local berries. Each dish comes with a heavenly house-baked scone (consider yourself fortunate if they’re serving strawberry ones when you’re there). This funky restaurant adjacent to the Peñasco Theatre is also filled with local artwork. Just down the street, you can browse at the small farmers’ market outside Gaucho Blue, a contemporary art gallery owned by Nick Beason, who produces vibrantly colored monotypes and serigraphs, and Lise Poulsen, a fiber artist who uses felt to make everything from kimonos to vases. Also check out the hand-dyed and -woven wool rugs from members of TDLT Fiber Artisans, a nonprofit co-op that also uses this gallery space. Spend the rest of the day stopping by studios between Peñasco and Truchas that you missed the first day. Sharing a space in the heart of Peñasco, Walking Woman Gallery specializes in pottery and paintings, and Art for the Heart Gallery carries a large selection of folk art and fiber works. About 10 miles south, Ojo Sarco Pottery provides a chance to browse functional yet whimsically designed serving platters, porcelain vases, and teapots. In Truchas, drop by the studio of Sally Delap-John to view her plein air oil paintings that capture northern New Mexico’s rich color palette. Her subjects in these ancient Río Grande Valley villages have included chapels, blossoming trees, and dilapidated adobe buildings (one is aptly titled Returning to Dust). Down a long driveway off NM 76 you’ll find Bill Loyd & Anna Karin Studio Gallery, one of the most visually alluring properties on the tour. The grounds are festooned with Loyd’s fanciful sculptures created with discarded scrap metal. He specializes in soothing wind bells fashioned from old steel pressure tanks and painted in every imaginable color. Inside the main building, Karin’s oil-on-linen landscapes and still lifes share space with stunning contemporary photography by Craig Scogin and abstract paintings by Jeane George Weigel. Once you’ve wrapped up gallery touring in Truchas, it’s a 30-minute drive south via Chimayó to reach the Estrella del Norte Vineyard, which sits just outside Pojoaque near the start of the High Road route. Visit the shop for a tasting. If it’s a warm afternoon, sip the acclaimed Founders Bordeaux blend or a glass of sauvignon blanc on the garden terrace, toasting the art treasures you’ve picked up and the artists you’ve gotten to know. The opportunity to talk with artists about their work and see where they create is reason enough to explore the High Road during studio-tour weekends, but late September also offers crisp alpine weather and panoramas of golden aspens. If you’re unable to make this drive on one of the tour weekends, take heart—many galleries mentioned here are open year-round, and even smaller studios often welcome visitors by appointment. 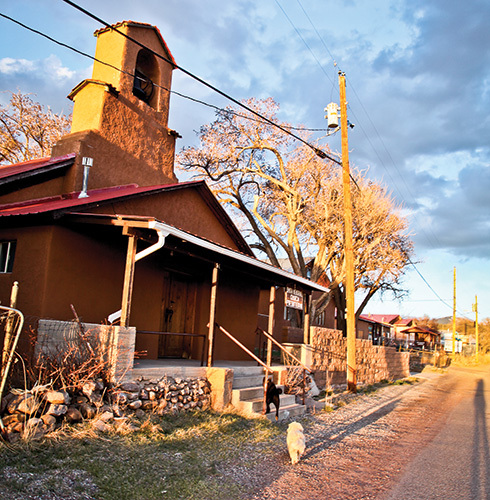 Note that within a short drive of the High Road, the Pojoaque River Art Tour (pojoaqueriverarttour.com) coincides with the first weekend of the High Road Art Tour, and The Paseo in Taos coincides with the second weekend (see p. 66). THE ROUTE To allow time to visit a good selection of studios, spend a couple of days driving the well-signed, 68-mile High Road. One strategy: Make your way north the first day, then backtrack the day after. Start in Pojoaque, heading E. from US 285 on NM 503. Continue about 8 miles, then turn N. onto CR 98 and drive 2 miles to Chimayó, home to several galleries and a handful of dining and lodging options. Next head E. on NM 76 to Truchas. In the village center, detour a couple of miles E. on CR 75 to reach some key studios and take in some of the best scenery on the route. Return to NM 76 and continue NE. for about 15 miles to Peñasco, where the High Road continues E. onto NM 75. (You’ll find a handful of participating studios between Truchas and Peñasco in the tiny villages of Ojo Sarco and Chamisal.) Follow NM 75 E. about 5.5 miles to the east side of Vadito, and then turn N. on NM 518 for 16 miles to Ranchos de Taos. OVERNIGHT At either end of the High Road, Santa Fe and Taos abound with lodgings, and just a 15-minute drive west of Chimayó, Española has several economically priced chain properties. You won’t find many places to stay on the route itself, with the exception of Chimayó, which is home to some charming B&Bs: Casa Escondida, Rancho Manzana, and the Hacienda at Rancho de Chimayó. These small properties tend to book up quickly during the studio-tour weekends. In Taos, consider Adobe & Pines Inn B&B, the nearest lodging to the northern end of the High Road. This rambling 1830 compound shaded by conifers and cottonwoods is filled with distinguished paintings and local crafts. Gourmet breakfasts are served on the back terrace. Quite a few High Road artists are accomplished creators of carved wooden bultos and santos and handwoven textiles—traditional Spanish Colonial arts that date to when communities like Truchas and Chimayó were first established in the late 1600s. But plenty of contemporary talents thrive here, too. Some, like Chris Morel in Vadito and Leigh Gusterson in Llano, fill their canvases with breathtaking High Road scenery, from the farmsteads east of Peñasco and Chamisal to the rocky summit of 13,100-foot Truchas Peak. You’ll find many galleries in village centers. For other places to stop, watch for handmade signs advertising Spanish Colonial retablos or handmade blankets. 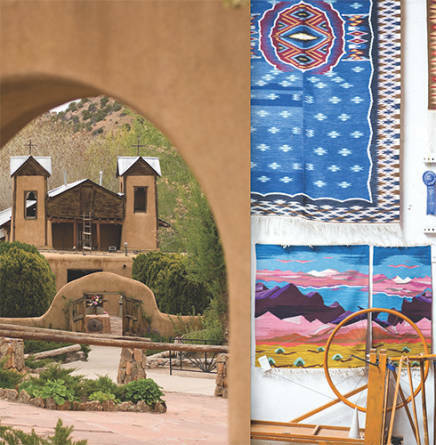 “There’s been a core of artists who’ve been involved with the tour for years, but newcomers open studios in the area all the time,” says Sally Delap-John, board president of the High Road Artisans organization, who recommends checking the official website (highroadnewmexico.com) for the most current list of participants and a detailed tour map. “Our special focus during this year’s tour is local art and farming,” says Franke. Stock up on chile ristras, apples, and tomatoes at farm stands outside galleries in Peñasco and Truchas. A few area farms will also welcome visitors.